Easy - improve email contact list In Only 3 Clicks. Bulk Email Addresses - verify bulk email list and instant report. Fast - the World's Number ONE fast email address verifier. Updated - always keep your email contact list updated. Check Email Address Validation Now! Dr Email Verifier is a simple email checker that is specially designed for you to check and verify the validity of all your email addresses in a few simple steps: pasting your email address on the blank, clicking "Check Now" button and reading the checking result. With Dr Email Verifier, you always can quickly know whether your specified email addresses are valid or not and efficiently keep your emailing list clean all the time. 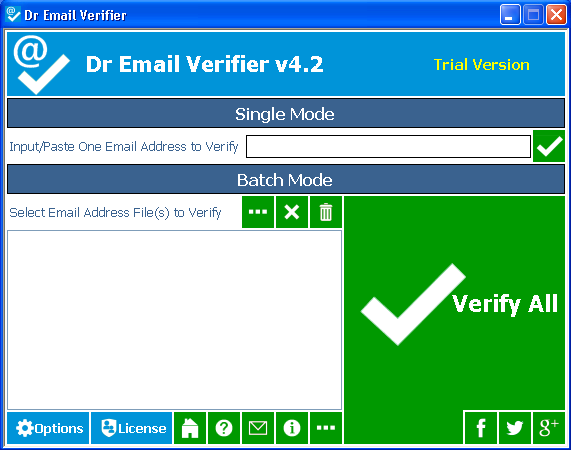 Firstly, Dr Email Verifier is designed to be as simple as possible. It has no any difficult or complicate option or operation. Secondly, with Dr Email Verifier, you often can check the validity of your assigned addresses in only three steps: pasting your email address on the blank, clicking “Check Now” button and reading the checking result. So, it is really an easy-to-use email checker. With Dr Email Verifier, you cannot only check whether all your assigned emails are valid in seconds and also can easily verify whether they exist on the email server from its “Description” function. In order to make its results more reliable and convincing, Dr Email Verifier will also show you the detailed information of your input emails in its “Interaction” section, including telling you’re the interaction between Dr Email Verifier and the destination email sever, telling you the reasons why you get the result and more. Aiming to get a right and convincing result, Dr Email Verifier will also automatically skip some unsupported email servers for you. 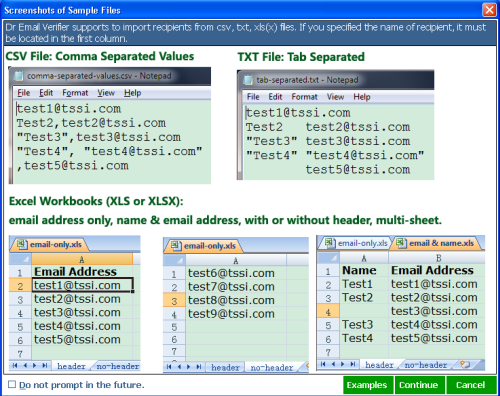 It supports email address lists in the following formats: .csv, .xls, .xlsx that you keep your email address list. And this is supported by most email address contact list. I am using Dr Email Verifier, which is able to verify email addresses are valid or not (format or syntax). It is helpful to me to keep a clean email list. Thank you for developing such great tool that helps me improves my clients' contact list and removes bad email subscribers. It saved me from becoming a spammer. Thank you Thank you..